The Saudi air campaign is targeting schools, hospitals, markets—and US military support makes it all possible. A human-rights catastrophe is now unfolding in Yemen—a catastrophe aided and abetted by the US government. Much angst and outrage has justifiably been expressed over the slaughter in Syria and Iraq, but very little about the daily bombing in Yemen, where thousands have perished since Saudi Arabia and its allies began an air campaign a year and a half ago. Nor has there been much public criticism of American aid to the campaign, without which the Saudis would be forced to curb or abandon their deadly attacks. This inexcusable neglect of Yemen must stop now. Yemen, a deeply divided, desperately poor country on the southwestern fringe of the Arabian Peninsula, has long been fractured along tribal, sectarian, and regional lines. 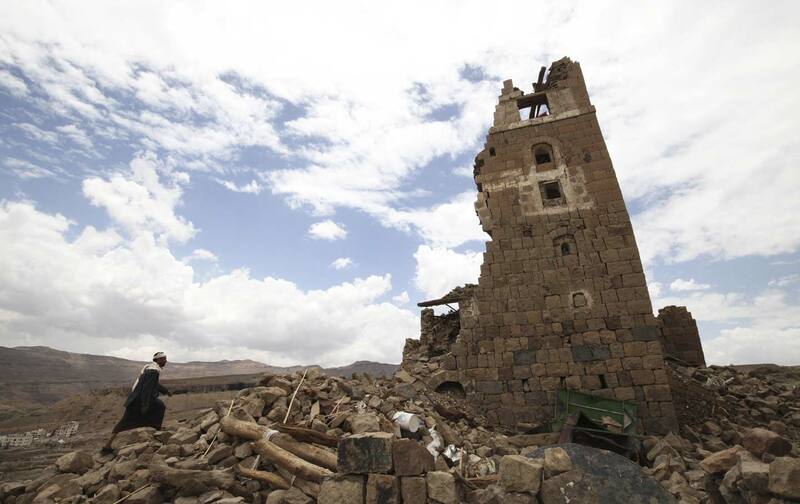 It plunged into civil war in 2014 when Houthi rebels—Zaidi Shia Muslims from the country’s rugged north—invaded Sanaa, the capital, and ousted the Saudi-backed president, Abdu-Rabbu Mansour Hadi. Hadi then fled to the southern part of the country, which has long fought dominance from Sanaa and the north; when the Houthis advanced toward Aden, the largest city in the south, Hadi fled to Saudi Arabia and appealed for its assistance in battling the rebels. Saudi leaders, who view the Houthis as proxies for Iran—their main rival in the Middle East—then commenced a military drive to defeat the rebels and reinstall Hadi as president. (Just how closely the Houthis are tied to Iran is a matter of dispute, with many analysts arguing that the link is real but tenuous.) The Saudis also sought to demonstrate some military muscle of their own, especially in the wake of what they see as diminished US power in the region, as reflected in Washington’s pursuit of a nuclear deal with Iran. The Saudis’ original game plan was to drive the Houthis out of southern Yemen, install a rump government headed by Hadi there, rally assorted tribal and local militias to its cause, and then drive the Houthis out of Sanaa. To a degree, this plan worked: Saudi air attacks and naval bombardments decimated rebel forces—killing many civilians in the process—while local militias, always antagonistic to northern dominance, succeeded in pushing the Houthis and their allies out of much of the south. But once the rebels retreated back to Sanaa, the Saudi-backed offensive collapsed and a stalemate ensued. At this point, the Saudis became desperate. Rather than concede the failure of their strategy or agree to a negotiated settlement with the rebels and other key actors in Yemen, such as former president Ali Abdullah Saleh (who has sided with the Houthis, his former enemies), they chose to escalate the air campaign—much as the Syrian government (with strong Russian assistance) has done in Aleppo and other rebel-held areas of that country. Much as in Syria, moreover, the Saudi campaign seems to be aimed at undercutting popular support for the rebels by attacking civilian targets: schools, factories, public markets, hospitals. At least four hospitals run by Doctors Without Borders have been struck in this manner, forcing the organization to withdraw its staff from the northern part of the country and leaving the people there with precious little medical care—just as is the case in rebel-held areas of Aleppo. Despite Saudi claims that they are striking military targets only, civilians appear to be the main victims of the air war. According to UN reports, at least 4,125 civilians have been killed since the onset of the air campaign in March 2015, and another 7,200 injured. As in Syria, children have figured prominently among the dead and wounded: By last August, UNICEF reported, 1,121 children had been killed in the conflict, many of them in air strikes, and another 1,650 injured. And this was well before the October 8 Saudi attack on a funeral in Sanaa, which killed at least 100 people (including some children) and injured many hundreds more. Voicing outrage at the death toll, UN Secretary General Ban Ki-moon called for an investigation to determine if the strike constituted a war crime. This is reason enough to command our concern and attention. But what sets this apart from the similar horrors in Aleppo is the fact that many (if not all) of the bombs being dropped on these civilians were provided by the United States and that the planes used to deliver them were in many cases guided there by US-supplied target data and refueled mid-air by US tanker planes. If Saudi Arabia is eventually found guilty of war crimes, the United States, at the very least, is an accessory to the carnage. If Washington’s involvement in the Saudi intervention has been largely invisible to people in this country, quite the opposite is true to people in Yemen. Digging through the rubble of schools, markets, and homes destroyed by Saudi air strikes, Yemenis have found bomb fragments that bear the unmistakable marking of US origins, including, in some instances, cluster-type munitions—which are banned by a 2008 international treaty (but one not signed by the United States). As a result, even those Yemenis who do not support the Houthis have turned against the United States. That US support for the Saudi air campaign is fostering anti-Americanism in Yemen became painfully evident in mid-October, when US warships fired cruise missiles on Yemeni radar installations supposedly used by the Houthis (or their allies) in unsuccessful missile attacks on an American warship. For US officials, this was simply a matter of retaliation for those attacks; for many Yemenis, however, it was clear evidence that the United States is deeply enmeshed in the Saudi campaign. According to Washington, the US warship was conducting “routine operations” off the coast of Yemen when it was fired upon, but for the Yemenis—many of whom face imminent starvation because of a Saudi naval blockade of food and fuel imports—there is good reason to suspect other, more nefarious reasons for its presence there. As a result of the international outcry over the lethal October 8 strike, the Saudis agreed to a temporary cessation of hostilities in Yemen. The cease-fire was not renewed, however, and on October 29 the Saudis resumed their attacks on civilian targets in Yemen, killing 18 people in the western city of Taiz and another 60—most of them prisoners, and so unable to seek shelter—in the port city of Al-Hudaydah. Before it is implicated in any more war crimes, the United States should discontinue every aspect of its military support for the Saudi intervention. There is no compelling reason to assist Riyadh in this bloody and foolhardy misadventure, and every reason to disassociate ourselves from the resulting carnage. From a purely practical perspective, continued support for the Saudis will only breed more anti-Americanism and terrorist violence in the Middle East. But it is the ethical dimension that should concern us the most: Continued neglect of US complicity in war crimes in Yemen will blight our moral authority for years to come and undermine our efforts to persuade others—for example, the Russians—to discontinue air attacks on civilians in Syria and other heavily populated areas.